One important goal in life is to have a few good friends and not waste too much time with acquaintances and casual friendships. 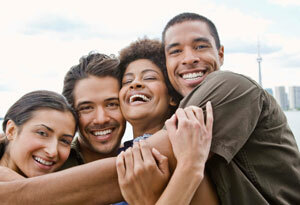 Here are some tips on how you can increase the odds that you will get quality good friendships. Truth: Some honest and interesting humans have one or two very close friends and most of us have casual good friends or none at all. Being truthful, honest, and sincere creates trust in a relationship and without it a strong bond with a person or a strong relationship is not possible. If you find that a potential new friend is a BS artist, exaggerates much, or even lies to you then drop them immediately. Truth: Be realistic, don’t expect to find new very close friendships because it is like searching for a needle in a haystack these days. You will have to settle for a good friend and not a new devoted one. First determine what your likes and dislikes and your loves and hates are. When you have determined what you like very much or love to talk about such as a job, career, hobbies, family, traveling, fashion, cooking, music, sports, etc. make a list of them in order of importance in your life. Pursue your major or most important passions and try to find others who also have them and who can share them with you. When you meet a new acquaintance who has at least one of your favorite passions in common don’t be afraid or embarrassed to probe a little more and ask them about their other favorite and not so favorite things to do. The more that the human’s tastes and likes and loves match up with your own the greater is the probability that you can establish stronger bonds of friendship in the future. If you find the human has very little in common with you then don’t try to continue the relationship in a serious way. One parting question which you can ask such a human with which you seem to have very little in common is to ask whether they know of anyone who has a strong interest in one of your passions. If yes then you can ask a favor of them to reveal who that person is so that you can potentially contact them and use their name as an introductory reference. When first starting out a relationship don’t push too hard for time and information from them which might scare them away from revealing the information which you would really like to know. Start off with a casual relationship with mostly nondemanding interactions and some sharing which you can increase in frequency as time goes on. Don’t gossip or tell them about all the minute details of your life because you are wasting their time and they are not really interested in hearing you out. Keep all your communications with any friend or potential friend short and sweet and to the point. Don’t ramble randomly about unimportant events in your life. No one wants to waste time listening to you go on and on without a useful goal in mind. Once you find something important in common with each other then more intensely share information on the topic as time passes which can even include personal visits to home and common places of interest. You may be rejected at some point in the relationship because the human simply has more important priorities in life then to communicate with you. Don’t give up right away at the first rejection but try again. If you fail at communicating three times in a row maybe you should reassess whether you are considered important enough in the human’s life for the relationship to continue growing stronger. Make your friendships a priority in your life by setting aside time, energy, and maybe even some money to nurture friendships. Don’t limit potential friends to your age group only but reach out to some older or younger than you too. Strong interests in activities are seldom limited to one age group and you can share common interests with any aged human. A virtual friend can turn into a physically interacting friend especially if they are located close to you and some foreign friends may come in handy if you intend to travel to their country at some point in the future. Most of your new friendships will start on the internet and you should join internet clubs, specialty social networks, and even blogs to optimize your potential friendship base. Once you have made contact with a potential new friend and find no passionate interests in common drop them like a hot potato because you will only be wasting your precious time, energy, and money which you can spend trying to find and interact with new potential good friends. Truth: Modern society has mostly lost the behavioral rules necessary to form lasting good friendships so don’t be too disappointed with most of the new selfish generation which doesn’t know how to find and maintain good friendships. CONCLUSION: Share your passions with friends who also have your passions. If you don’t have a passion or passions then find and develop a passion or passions by developing in depth knowledge about them. Only then try to share the passion or passions with other potential friends. It will increase the probability of a good friendship more than anything else!!!!!! My passion is finding the truth in everything and spreading it with evergreen blogging and evergreen book publishing. Join me if that is also your passion!!!!!! This entry was posted in common sense, education, love, science, society and tagged common sense, community, education, friends, friendships, love, relationships, science, society on May 20, 2013 by uldissprogis.